WHO: No. 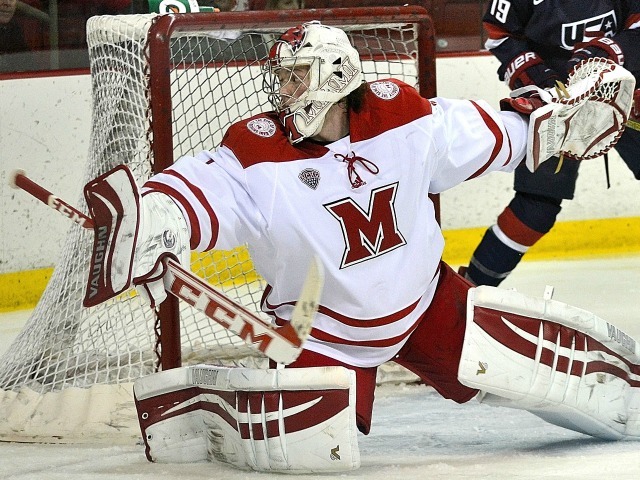 13 Denver Pioneers (12-7-5) at Miami RedHawks (9-11-3). WHERE: Cady Arena, Oxford, Ohio. WHEN: Friday–7:05 p.m.; Saturday–7:05 p.m.
TV: Friday–CBS College Sports (DirecTV Ch. 221); Saturday–Fox Sports Alternate (DirecTV Ch. 608-1). DENVER RADIO: Friday–KEPN-AM (1600), Denver, Colo.; Saturday–KKFN-FM (104.3). MIAMI RADIO: Both nights–WMOH-AM (1450), Hamilton, Ohio; WKBV-AM (1490), Richmond, Ind. NOTES: Miami has six home games left on its schedule with four to be played in the next nine days. The RedHawks are coming off a huge sweep at then-No. 7 Nebraska-Omaha and have won three straight games after a 6-11-3 start. But Denver is also on a hot streak, unbeaten in its last eight contests (5-0-3), as the Pioneers have surged into third place in the NCHC. DU goalie Tanner Jaillet was pulled last Friday after surrendering two goals on seven shots, and the Pioneers came back to win with Evan Cowley in net. Cowley is 73 of 74 since, so there’s an excellent chance he’s in net for the series opener, especially since Jaillet has an .897 save percentage vs. Miami. No one on Denver’s roster has scored 10 goals, but seven skaters have five or more makers. Dylan Gambrell – a freshman – leads the Pioneers in points with 24 on seven goals and 17 assists, and Trevor Moore leads the team in assists with 18 and has 21 points. Danton Heinen has a team-best nine goals and has nine assists for 18 points. The Pioneers have two blueliners who create offense as well. Will Butcher, a Colorado Avalanche draftee, has five goals and 11 assists, and Nolan Zajac – younger brother of NHLer Travis Zajac – has notched a goal and 12 helpers. Freshman forward Josh Melnick has recorded points in four straight games, and senior forward Sean Kuraly and junior forward Anthony Louis have points in three consecutive tilts. Kuraly has notched six points during his run, including five assists. Senior Jay Williams has been in net for all three of Miami’s wins during its current run. Classmate Ryan McKay has been scratched for all those games, and it’s unclear if he will return to the lineup this weekend. These teams are 9-9 all-time against each other. They split their four regular season games in 2014-15, and Miami beat Denver in the NCHC Tournament. The Pioneers ended the RedHawks’ 2013-14 season by winning in the NCHC final. I've been writing about hockey since the late 1990s. First it was the Cincinnati Mighty Ducks and the Cincinnati Cyclones for the Cincinnati Post, and most recently with WCPO and the Blog of Brotherhood online. Posted on January 29, 2016, in 2015-16, University of Denver and tagged dylan gambrell, evan cowley, Jay Williams, Sean Kuraly, tanner jaillet, university of denver pioneers. Bookmark the permalink. Leave a comment.